No matter where they live or work, health professionals, researchers and the public can access information from the National Library of Medicine thanks to its National Network of Libraries of Medicine (NN/LM), consisting of more than 6,000 libraries coordinated by the NLM and supported by eight Regional Medical Libraries (RMLs). NLM In Focus is showcasing the libraries awarded contracts to serve as RMLs for 2011-2016. In this article we introduce you to the people and projects of the MidContinental Region (MCR). Stretching from the confluence of the Missouri River and the Mighty Mississippi, just north of St. Louis, across the Great Plains and on to the towering mountain ranges of the west, the midsection of this country features a vast expanse of sparsely populated prairie and rangeland, daunting distances, emblematic rivers, and great cities. The NLM’s MidContinental Regional Library (MCR), headquartered at the Spencer S. Eccles Health Sciences Library at the University of Utah in Salt Lake City, serves this large and diverse region by supporting libraries and information centers spread across Colorado, Kansas, Missouri, Nebraska, Utah, and Wyoming. Unlike other RMLs, the MCR does not operate from a central site but through six state and two project coordinators who serve local and regional needs, and direct local outreach projects. The Salt Lake City staff coordinates frequent meetings and videoconferences to keep everyone in touch. NLM in Focus spoke with, or received contributions from, MCR Director Jean Shipman, Utah, and Associate Director Claire Hamasu, Utah (Spencer S. Eccles Health Sciences Library, University of Utah, Salt Lake City, UT), and coordinators Dana Abbey, Colorado (Health Sciences Library, University of Colorado Anschutz Medical Campus, Aurora, CO), John Bramble, Utah (Spencer S. Eccles Health Sciences Library, University of Utah, Salt Lake City, UT), and Jim Honour, Wyoming (University of Wyoming Libraries, Laramie, WY). Also: Barbara Jones, Missouri (Otto Lottes Health Sciences Library, University of Missouri, Columbia, MO), Marty Magee, Nebraska (McGoogan Library of Medicine, University of Nebraska Medical Center, Omaha, NE), Monica Rogers, Nebraska (Health Sciences Library/Learning Resources Center, Creighton University, Omaha, NE), and Rachel Vukas, Kansas (Archie R. Dykes Library, University of Kansas Medical Center, Kansas City, KS). 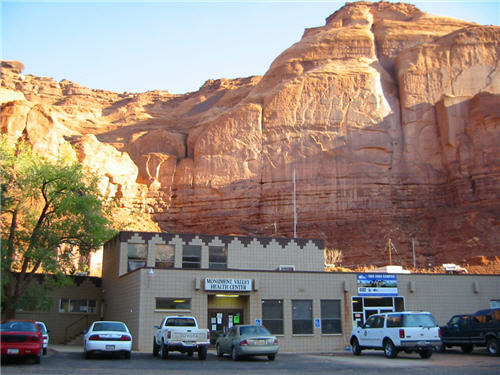 The Monument Valley Health Center provides medical, dental, and behavioral health care in neighborhoods throughout the northern portion of the Navajo Nation and southeastern Utah. Geography plays a huge role. We have frontier areas and very rural communities as well as major cities spread out across great open spaces. But thanks to technology, we are able to work closely together. 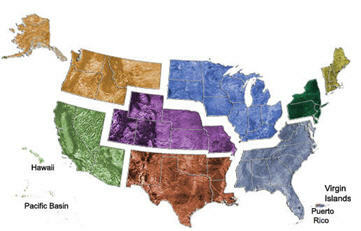 Each state has its own coordinator, and that really helps us keep a local focus. The coordinators know their state better than anybody. We get together via Skype and Adobe Connect for online conferences. This cuts travel time and speeds our services locally. Each state has its own characteristics, but the needs of our communities are basically the same. So we don’t implement programs for just one state and not the others. That said, we face many of the same issues as other regional libraries. The downsizing and closure of hospital libraries is a big challenge, made worse by the recession and continuing economic uncertainty. There is also an attitude among some administrators that having access to a collection (whether it’s print or electronic) and the Internet is all that staff in a health care facility needs to answer questions about quality patient care. These are the decision makers but they fail to recognize the benefit an experienced librarian, working on a committee or team, brings to identifying, retrieving and providing the most useful information. We are working with our network members to help them better explain and demonstrate their value. And we are introducing them to new roles they can assume to further benefit their organizations. This is a challenge. Fewer qualified health sciences librarians in the region means that more health professionals go without their information needs being adequately met. Library advocacy is a special interest of ours. We ask the question: What is your library worth to your institution? We’ve developed programs that can calculate the cost to buy library services on the open market. For example, how much would you have to pay to view articles if your library was not there offering this service? The point is to equip the health science librarian with the necessary tools to educate and advocate for their libraries and themselves. We want people to understand the value libraries and librarians bring to hospitals and health care professionals. Some of the online tools we have developed to help convince hospital administrators and others include: the Library Value Calculator, the CBA/ROI Calculator for books and journals, and the Database Calculator. We couldn’t exist without technology. We can work together and offer services despite the distances because of Skype, Adobe Connect, and other collaborative software that allows us to share information, provide training, and swap experiences. We also have several weekly blogs, a Twitter presence, and a Facebook page. And we maintain e-mail, of course, which most members seem to prefer over Twitter or Facebook for keeping in touch. Our Under-Connected CBO iPad Project is a health literacy and technology initiative that works with community-based organizations that target at-risk, low-income, or disadvantaged, populations. Over the last two years, we partnered with six CBOs in Colorado, Kansas, Missouri, Nebraska, and Utah, providing each with an iPad, a 10-month cellular data plan, and training on iPad and NLM online resources. In turn, the CBOs report on the impact that incorporating iPads and increasing access to NLM resources has had on their outreach programs. The project has been an overwhelming success. For instance, a Salt Lake City CBO, Comunidades Unidas (CU), found that tracking donations to their annual Pink Dress Gala fundraiser was much more efficient online than on paper, as done in the past, including capturing guests’ information, registering them and collecting their contributions. In their first two months accessing the Internet, CU also was able to point more than 300 people, as well as the Consular Office of Mexico, in Salt Lake City, to the resources available on infoSIDA and MedlinePlus. Since then, they have also taught people about MyPlate, preventive health measures, and referred them to local support services. CU continues to collaborate with the Mexican Consulate, providing a Ventanilla de Salud (mobile health booth) to accompany the consulate’s mobile health clinic as it travels to health fairs and public events in towns and cities throughout Utah and western Wyoming, providing consular services, as well as health information and screenings. Through a partnership with an Affordable Care Act (ACA) navigator, CU helped train the consulate’s health counselors in the qualification and requirements needed for people to sign up for services through the ACA. In one instance, a CU staffer was able “within seconds” to help a Mexican counselor access the appropriate ACA materials to help a family understand their options and the steps necessary for them to receive health care services. In another, using her iPad and knowledge of MedlinePlus en español, a CU staffer helped a client understand why she needed to seek immediate medical treatment, helped determine the questions the client should ask the doctor, and directed her to the nearest community health center. In Missouri, the MCR worked with the Society to Improve Diagnosis in Medicine on an Expert Health Search pilot project, a medical librarian service that assists patients struggling to obtain correct diagnoses while under a physician’s care, or patients successfully diagnosed but not responding to treatment. MCR staff helped to establish the project’s mission and goals, as well as the process, talking points, and evaluation survey. As designed, under the banner Expert HealthSearch, a team of five librarians from across the country who are passionate about helping people and are working on their own time at nominal rates does the actual searches for patients. In Nebraska, MCR collaborated with Health Literacy Nebraska on a series of quarterly webinar workshops on MedlinePlus, NLM Mobile Resources, and the Patient Education Materials Assessment Tool. As a Project Partner with the Nebraska Library Commission working on Nebraska’s Broadband Technology Opportunities Program (BTOP), staff attended workshops focused on increased outreach to the state’s rural libraries. Eventually, this led to joint presentations on health resources with the University of Nebraska Medical Center, Consumer Health Information Resource Service (CHIRS) program in several different settings. Our mission has always been to engage with all the people in our states and find out what they need for health resources Our goal is to support and expand access to the very best health information in the world—the resources offered by the NLM. 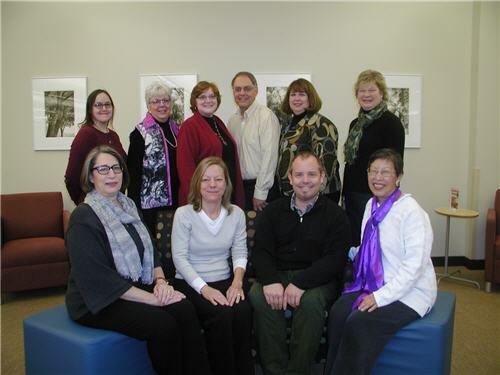 Staff from the MidContinental Region include: Front row (l-r) Betsy Kelly, Dana Abbey, John Bramble, Claire Hamasu; back row (l-r) Monica Rogers, Barb Jones, Rachel Vukas, Jim Honour, Marty Magee, Jean Shipman.